A startup has kicked off an IndieGoGo campaign to fund a new concept in LED light bulb replacements: flat, under $10 (and dropping), highly manufacturable, and made in the USA. The company is NliteN and its principal is Andy Turudic, a well-traveled entrepreneur in the electronics business. By way of full disclosure, a couple of members of this community are involved with the product: Founding editor Lee Goldberg is handling the PR and Dennis McCarthy was given an advance look at the 2D-Lite LED Disk and is quoted in the press release. The 2D-Lite is an entrant in the Philips Innovation Fellows competition (Philips subsidiary Lumileds sponsors this site). Philips is working with IndieGoGo on the competition, entry into which is by invitation only and closes tomorrow. Turudic told me in an interview that he moved up the launch date for the 2D-Lite by several months in order to be able to get into this competition. Here is the 2D-Lite's IndieGoGo campaign. If it is successful in raising $250,000 over the next 60 days, NliteN promises 2D-Lite LED Disks manufactured in large numbers by next spring. Indeed, the device is designed for low-cost automated manufacturing, and that's a big part of why NliteN is able to project such a low target price. The product's promises are appealing: a 60-Watt equivalent (800-lumen class) replacement initially for under $10, with the price dropping to $6 by 2015 and to $3 by 2017; a near-uniform spherical distribution of light; full dimmability; and grid friendliness with "utility dimming" capability. The latter feature is the subject of one of the dozen or so patents NliteN has filed. When the electrical grid is under strain, utilities may choose to lower line voltage. The 2D-Lite responds to this by dimming, as if it were a purely resistive load -- and therefore its power factor is "beautiful," as Turudic put it. He believes that this grid-friendly feature will encourage utility companies to offer rebates on 2D-Lites, making them even more attractive. And in fact the "constant V/I" driver design will be available for others to use from at least two driver makers, Turudic said. The design uses Bridgelux SM4s "for now," Turudic told me. They produce 800-lumen class light at either 3000K or 4000K color temperature, with CRI above 80. "Bridgelux, being American, fits our intent of maximizing American company content and doing the manufacturing here in Oregon," Turudic added. The 2D-Lite, if it indeed gets manufactured, will be very clearly superior to incandescent bulbs (as pretty much any SSL replacement would be). Turudic has set his sights beyond displacing that relic of century-old technology, and is intent on beating compact fluorescents in the marketplace, even without subsidies. "My mission in life is to kill the CFL," Turudic told me, in order to leave the world better than he found it. "If I didn't have kids I wouldn't be doing this." Many product details have been thought out with a green sensibility. Turudic told me that the standard retail packaging for the 2D-Lite will be eight to a box; the box is the size of a sheet of paper and 1 inch thick. "I didn't want to ship a box inside a box with a blister pack," Turudic said. Another retail option intrigued me: Drill a hole in the top of the bar-coded disk and thread it onto a point-of-sale hanger. Especially at the lower price points, LED light becomes a checkout-counter impulse buy. The appeal on IndieGoGo is tuned to catch the interest of the ecologically minded. 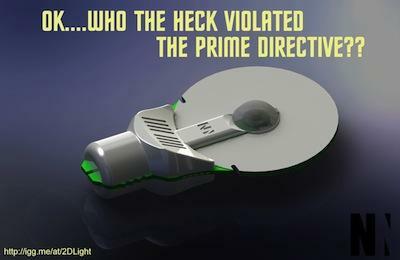 If the company makes it to 2017 and offers a $3 2D-Lite, they will be calling it the "Light Disk for the World." Can NliteN pull it off? I'm told that Andy Turudic has a track record. The product is compelling, especially with its price targets. 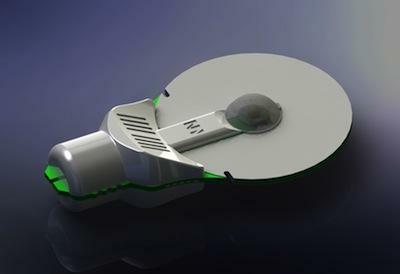 And it won't hurt the 2D-Lite's prospects one bit that it bears more than a passing resemblance to the Starship Enterprise.